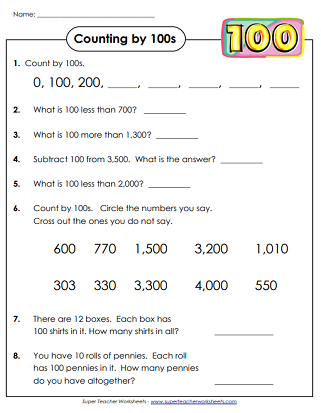 With these skip counting worksheets, students can learn to count by 100s. One hundred, two hundred, three hundred, and so on. The raft of penguins have all jumped up on an ice flow to display the numbers on their front sides. Count by 100s to be sure all of the penguins' numbers are correct. Count by hundreds up to nine thousands. Fill in the empty boxes. This worksheet has pictures of waterskiers. Count by hundreds from 100 all the way up to 2,400. Write the numbers on the balloon graphics. Skip count by 100s to fill in the missing numbers. 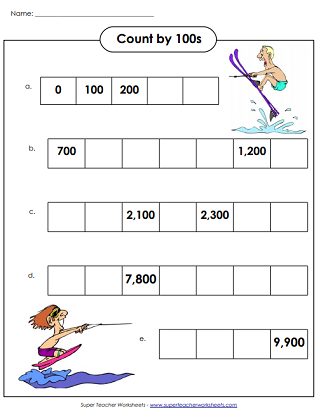 These word problems will build skip counting skills.